Another day, another drawing... Day #14 of Inktober. I've used this artistic event during the month of October to practice my 'gesture drawing'. For now, the pictures have been my studies/reading/re-reading/researching 'knifefighting.' Today's topic is on the vascular targets taught by Michael Janich of Martial Blade Concepts. 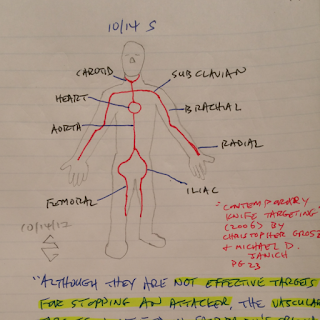 "Although they are not effective targets for stopping an attacker, the vascular targets identified in Fairbairn's original timetable are still valid knife targets. Here their locations are shown accurately superimposed on a photo. 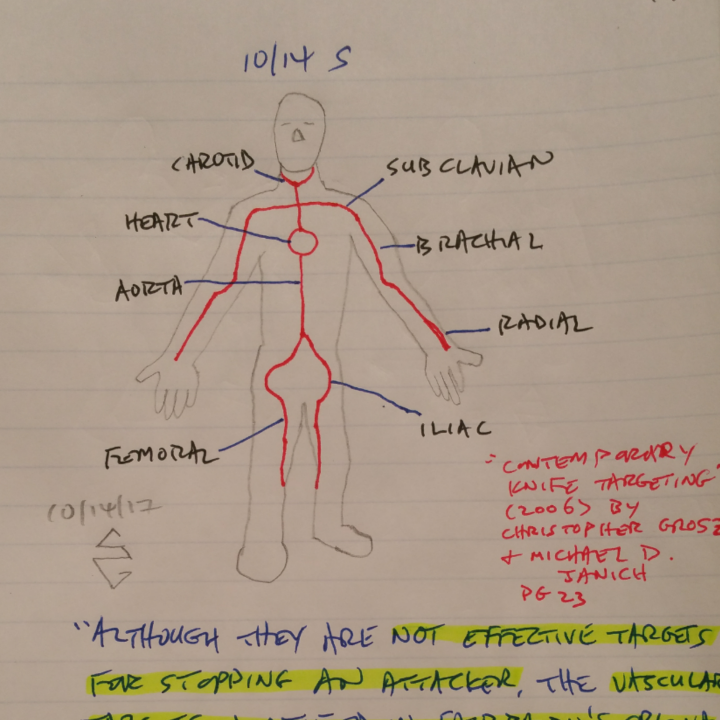 Note that the iliac artery - a highly vulnerable target that feeds into the femoral artery - has been added." Christopher Grosz worked with Michael Janich and Kelly Worden as well as Dr. Michael Joseph Dobersen. Their research found that Fairbairn's Timetable of Death is inconsistent with current medical knowledge. William E. Fairbairn's Timetable of Death from "All-In Fighting" (1942) - later reprinted as "Get Tough"
Grosz categorized anatomical targets into groups based on function and predictable effect which are: Distraction Targets, Vascular Targets, Nervous System Targets, Structural Targets, Organ Targets and Muscular Targets. "Vascular Targets - Targets that are designed to sever or disrupt the flow of blood from the heart to other areas of the body or back. These targets weaken the subject by blood loss, which can ultimately lead to shock, unconsciousness, or death. Examples of this target category include the arteries and the veins, but the primary emphasis is on arteries because of their much higher blood pressure and the fact that they carry the oxygenated blood required to maintain consciousness."